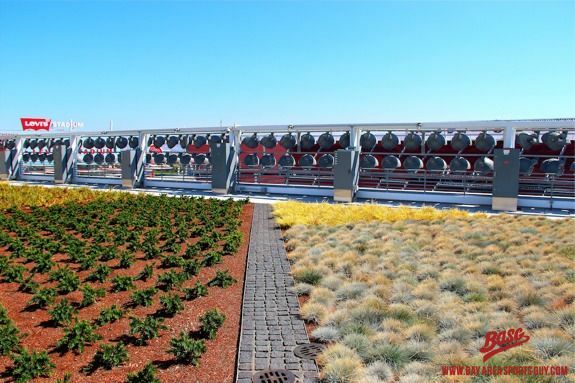 In honor of the exciting upcoming Super Bowl 50 this Sunday, February 7, we are once again highlighting the awesome Levi’s® Stadium as our Project of the Week here on Greenroofs.com. Whether you are a Broncos or Panthers fan, we know all fans of living architecture will enjoy the beautiful living roof atop this sports venue! Hosting the Super Bowl 50 on February 7, 2016, Levi’s® Stadium is a $1.27 billion multi-purpose facility with the flexibility to host a wide range of events with seating for about 68,500 people, featuring 176 luxury suites and 9,000 club seats. Fans attending San Francisco 49ers home games experience football in the most eco-friendly and sustainable LEED Gold certified facility in the league. State of the art technology is used throughout the stadium, and visitors may view a live dashboard display featuring current energy measurements, water and air monitors, and other dynamic green features as the building operates daily. Designed by HNTB, the iconic feature of the stadium is the massive 5-story Suite Tower on the west side, topped by the NRG Solar Terrace green roof. 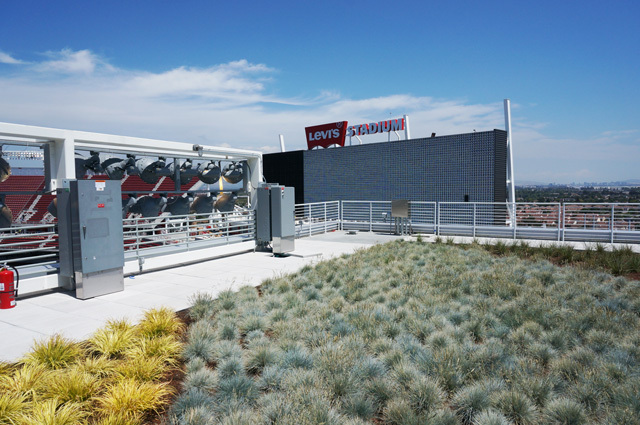 The installation of 1,186 solar panels on the canopy framework on the green roof and on three solar pedestrian bridges connecting the parking lot to the park generate 375 kW of power at Levi’s Stadium – as much renewable energy as it will consume on game days. 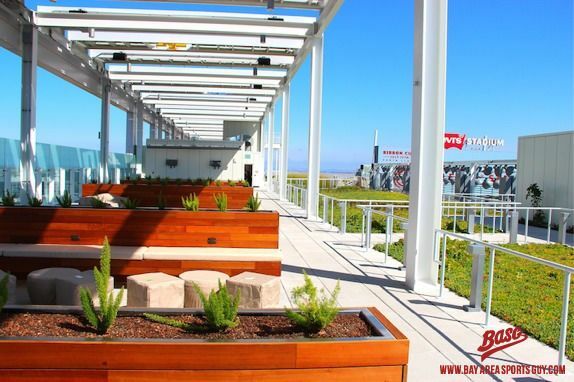 And the NRG Solar Terrace green roof is an inviting space which can be booked for receptions and ceremonies. The 27,000 square foot American Hydrotech green roof contains 16 species of vegetation native to the Bay area for the concessionaires, who will utilize produce within local farm-to-table menus. 85 percent of the water used at the stadium is recycled, used for both potable and non-potable uses such as the playing field irrigation water. VIEW the PROJECT PROFILE to see ALL of the Photos and Additional Information about this particular project in The International Greenroof & Greenwall Projects Database. 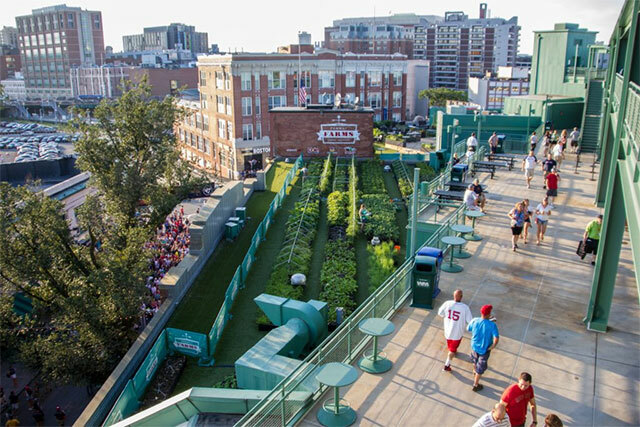 Landscape Architect & Greenroof Design: The Guzzardo Partnership, Inc. Solar Design & Installation: SunPower Corp.
Would you like one of your projects to be featured? We have to have a profile first! Submit Your Project Profile. 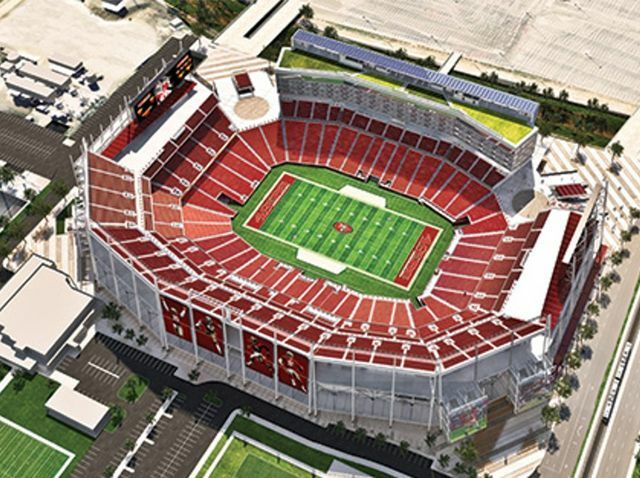 1 reply to "Project of the Week for February 1, 2016: Levi’s® Stadium"
Thanks for including The Guzzardo Partnership, Inc. as a listed contributor? 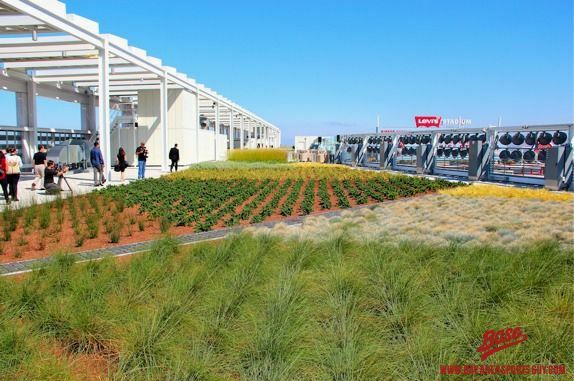 We are the Landscape Architects of record for the Levi’s Stadium project and the designers of the actual “green” on the green roof. Not HNTB or American Hydrotech or Jensen.